Change your mind about the color of your car? Something not working for you? Within 3 days of purchase, we'll exchange it. No questions asked. If we advertise your vehicle for a lower selling price within 90 days of your purchase, we'll refund the difference. Our award-winning service department provides tremendous value. We guarantee our prices are at or below any other Toyota dealer. You will never pay more! We inspect and recondition every used vehicle we sell. But nobody is perfect. If your vehicle requires an unreasonable amount of service, we'll exchange it for a vehicle of equal or greater value. (1) Return Guarantee applies to new car purchases only. Vehicle must have been driven less than 300 miles and be in exact condition as sold. Exchange for a vehicle of equal or greater value. If greater, customer pays only the difference. (2) Customer must bring in North Hills Toyota advertised lower retail selling price on the exact same vehicle (Yr, Make, Model, and MSRP) within 30 days of purchase. North Hills Toyota will refund the difference to the purchaser. The difference must be in the selling price, and does not include any changes in discounts or incentives offered by the manufacturer. Valid on new vehicles only. See dealer for complete details. 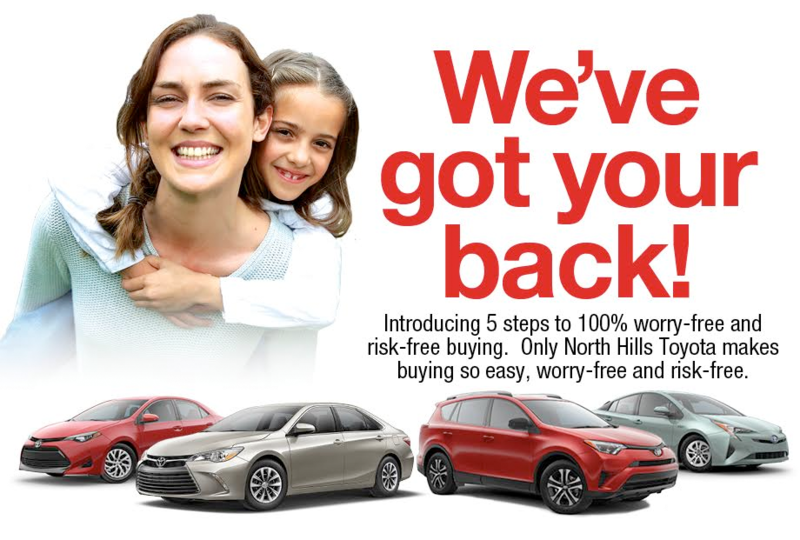 (4) North Hills Toyota will match any other Toyota service price. Original proof in the form of competitor dealer advertisement, mailer, or written quote required. (5) 30-Day Lemon Free Pledge subject to North Hills Toyota's reasonable determination in its sole good faith discretion. Customer responsible for price difference of exchanged vehicle, if any.